138 pages | 3 B/W Illus. This book is about the history, present and future of one the most important policy ideas of the modern era – that there is a single, global dangerous amount of climate change. That dangerous amount of climate change is imagined as two degrees centigrade of global warming above the pre-industrial average. Though the two degree idea is based on the value system of elite policy actors, it is been constructed in public discourses as scientific fact. This false representation of the concept undermines opportunities for positive public engagement with the climate policy debate, yet it is strong public engagement which is a recurring aspiration of climate policy discourses and is considered essential if climate mitigation strategies are to work. 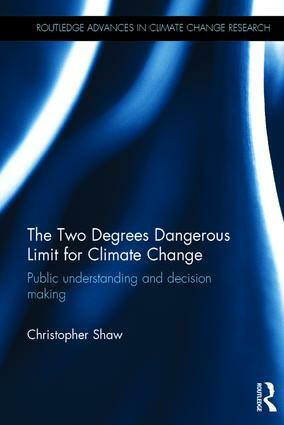 Alongside a critical analysis of how the idea of a single dangerous limit has shaped our understanding of what sort of problem climate change is, the book explains how the public have been kept out of that decision making process, the implications of this marginalisation for climate policy and why the dangerous limit idea is undermining our ability to mitigate climate change. The book concludes by exploring possibilities for a deliberation about the future of the two degree limit which allows for public participation in the decision making process. This book illustrates why, at this critical juncture in the climate policy debate, the two degree limit idea has failed to achieve any of the policy goals intended. This is the first book dedicated to questioning the issue of the two degree limit within a social science framework and should be of interest to students and scholars of environmental policy and politics, climate change communication, and science, technology and society studies. "The Two Degrees Dangerous Limit for Climate Change is a valuable contribution to the critical debate about global climate targets, which has entered a new phase after the Paris Agreement." Christopher Shaw is a Knowledge Exchange Research Fellow at the Environmental Change Institute at the University of Oxford, and Visiting Fellow at the University of Sussex, UK.